Seattle (ESTRA) - Although we’ve hardly been into this winter season, there have been multiple car crashes with rain, snow, icy roads, and floods. There is nothing more surprising than to be driving in decent weather which immediately turns bad. Visibility can be less than to the end of car’s front end, rain down pours can bring inches of water which make driving on roads nearly impossible, frozen roads can mean slips and slides resulting in driving off streets. When running into bad weather, the possibilities of disastrous situations becomes more probable. The NHTSA estimates over 1.3 million weather related accidents happen per year. Most people are use to daily routines, and expectations are set to this standard. However, every day is not always the same. Especially when experiencing unfamiliar weather patterns. Reactions are anywhere from panic to claim, from freezing to over-reacting. Information is invaluable in helping to make better decision when in difficult winter weather conditions. What comes to mind when in trouble? What you have learned will help resolve the problems. Awareness about what to do in different bad weather conditions just might change the outcome of a difficult situation. Preparing vehicle is one of the first steps in winter preparation. Many people experience car maintenance issues at the time of weather changes, especially when coming from hot to cold weather. Therefore, be sure to complete any needed repairs before a change in climate. Financially for some, this may not be possible, so do your best with available resources, especially fluid levels, windshield wiper blades, belts, and chains underneath the car hood. When able, be sure to get repairs done. A car well maintained, means less surprises and longer vehicle life, typically. Simple maintenance can be done by most people with review of videos or written instructions. This may save money and help to become familiar with your car. So evaluate if this option will work for you. Different geographical areas require unique items to carry in car. Yet some common items are flashlights, electrical tapes, candles, matches, blankets, kitty litter, water, food, jumper cables. The condition of each vehicle vary, this may also impact how much is required in winter. It is also a good idea to keep gas tank half full in case of an emergency. A warm car can be beneficial in surviving problems which arrive. In fact, it may not be your problem, but someone else. Have you spend hours waiting on freeway due to a traffic collision? Be informed and ready for what may come your way is important in overcoming obstacles. Therefore, create an emergency safety kit for you, family, and friends who may be passengers in your car. This uniquely designed kit by you will include items that may not be included in standard emergency kits but necessary in your particular circumstances. Seattle is known from it’s rainy weather. Fortunately, this has taught many people to drive safely on wet pavement and rain down pours. Precipitation ranges from light to heavy. There are still accidents during rainy weather, along with mudslides, and flooding. NHTSA reports that wet pavement nationally causes an average of 960,000 car accidents a year along with another 600,000 while raining. Checking tires prior to bad weather can help with traction along with checking tire air pressure. Do you know what the tire air pressure should be in tires? Do you know how to check it with a tire gauge? Do you know how to put air in tires? Or is there a place where you regularly get tires and fluid checks? These may be two of the most important things to do for vehicle and for your protection. Adjusting speed and distance may help avoid a collision which could take years to recover. Don’t be one of those people who say, "if only, I would have slowed down, or done something different". Those are situations you could have changed. Yet there are also many circumstances that are not foreseen, and there was nothing you could have done, so don’t beat up yourself for current circumstances. This is why you have an Auto Insurance and or Employer ERISA Policies. Hopefully, they will support you through difficulties and payments to these corporations have not been in vain. Keeping a copy of Car Accident by ESTRA in vehicles provides a checklist in the back of the book, along with additional information and support is great when reviewed before a crisis, but also helpful in the middle of one. Be sure to pick up a copy and store in your car. There is nothing more beautiful than to look out window while nestle close to a warm fire and see glistening snow. When viewing it from being out in a car, poor visibility, low temperatures, and deep inches of snow, perspective drastically change. Let’s hope you clothing are dressed appropriately to weather this storm. According to the NHTSA, around 200,000 accidents occur in snow-related collisions each year. Snow can turn to ice below the surface causing more driving problems in this weather. When in this environment, taking ones time and allowing lots of room in front and in back of your vehicle, can make a difference between coming to a stop safely and colliding with the cars in front or back of you. In snow storms, many times multiple car collisions occur. This is a reason to allow ample space between you and anything which surrounds this space including vehicles, in case of sliding, someone else getting stuck, and needing to get around them, or them around you. For many, its difficult to overcome a feeling of being out of control when a vehicle slips and slides in the snow. Learning self-correcting methods helps build confidence in these stressful situations and how to be responsive in bringing car back to a safe position. If living in a place where all four season are present yearly, be sure to take this opportunity and learn how to drive in all these weather conditions. In fact, remember to prepare your teenage drivers. Black ice is one of the scariest things one can encounter. It hits unexpectantly, providing little time to react, and still there is no guarantee where you are going to end up. A second can seem like it last an hour. Although most communities have government entities which go out and put down gravel and other items to help keep roads safe, they cannot protect every street. One is never so thankful when this situation ends, and especially when it stops safely. Make sure to take a moment to gather wits if you find yourself in shock from the experience. Instincts kick in, many react in ways that are sometimes unpredictable. NHTSA estimates 150,000 icy pavement accidents per year. Cold, freezing temperatures mean low speeds even when roads look safe. Allow extra time to reach destination. The key is to get there in one piece. Drivers get used to routines when going to work, home, or regular places. When construction is on the way to destination, sometimes one does not realize changes, or perhaps construction signs or placement is not clear enough to understand. Unfortunately, constructions workers are put at risk and sometimes struck by drivers. Therefore, use extra caution when coming upon road work. Remember, although you may drive these roads daily, it does not mean they will always remain the same. Use good judgment to protect you and those workers. Car accidents also create traffic delays for hours depending on seriousness and how much space is available for cars to pass. Again use care because other drivers may not always make same decisions when choosing which path to follow. There are many opportunities for unexpected things to come up while facing winter conditions. Adding fog to other bad weather conditions can make the situation worse. Fog alone, according to the NHTSA averages 31,000 car collisions a year. The important key to remember is that bad weather driving condition requires patience, awareness, and lower speeds. It’s all about living another day, not only for you but other drivers. Taking care of each other while on the road makes the difference of a good day staying that way rather than turning into a bad one. Keep lives moving forward without the life stops due to collision. It’s not worth it. The time and energy spent can be better used. What does all this mean? From my perspective, it means many people take for granted getting to their destination every day via vehicles. And this is a good thing, because for the most part, it speaks to reliability of our transportation systems, and for the most part, we are attentive drivers. It’s those time when distractions or unexpected events come into full view. Anything each of us can do to prevent a collision, even in the worst weather, means someone gets to live another day, has no injury, or doesn’t have to deal with insurance company for a collision claim. Consider when getting behind the wheel, your capabilities, and how you can be safe and keep others this way too. But if in a collision, recognize there are in this category 1.3 million wrecks estimated annually. This situation is common for many. Stay strong, let me walk with you through your journey. Read my book, Car Accident by ESTRA. 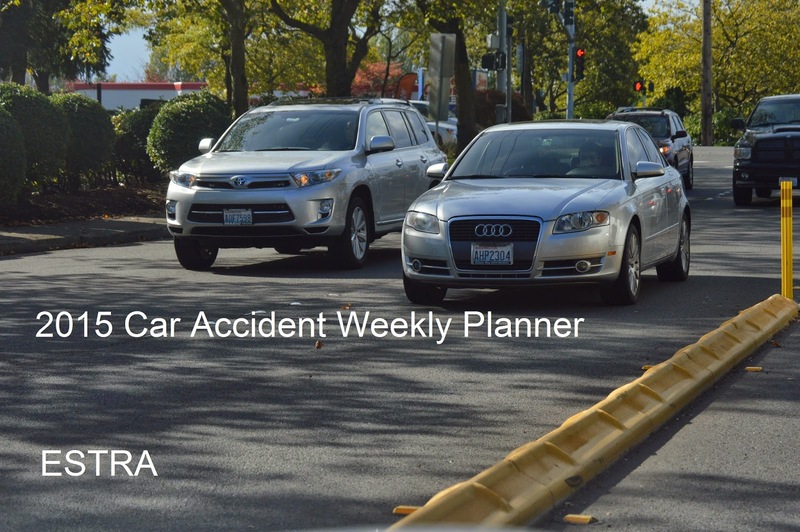 Get the Car Accident Weekly Planner for documentation, and let’s move forward together. Make it through whatever you may face. The key is don’t give up and become overwhelm by harassment and intimidation by Insurance Companies. Stay calm through situations. Sounds obvious? Yet, far from easy. Evaluate general level of injury of self and any passengers to tell Emergency Responders. If O.K. and able to get out car, check level of injury to people in other car(s). 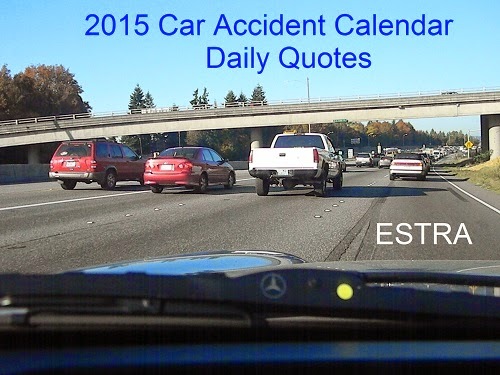 If everyone is O.K., use Checklist in book Car Accident by ESTRA. It will help check for things you might have forgotten. Also follow any insurance protocol required at accident scene accident. Call for appropriate help if needed. Use you cell phone to take pictures at the scene. These may be very important at a later date.